Do you Bikram? I'll be honest, I love yoga but for years have feared Bikram. Practicing yoga in a room heated up to 105 degrees with 40% humidity was not something I thought I would ever do. But then Bikram Yoga Herald Square opened. ...the impeccable studio. It always looks this spotless. I had to go. A gorgeous yoga studio right in our neighborhood, bringing the yoga to 34th Street and Herald Square? I HAD to go. An evening class at Bikram Herald Square. My first class was not this crowded! Bikram is all about the physical benefits of yoga. After my first two classes, I noticed improvements in my physique and thought "Woo hoo, finally this belly is going away!" Was I intimidated by the heat and the practitioners in almost no clothing with perfect bodies? Of course. But now I just look at those tiny shorts and say "Soon you will be mine." Seriously, it's inspiring. They even sell cute tiny shorts at BYHS. Also, there is big diversity in the classes at BYHS. You will not be the only beginner, or the only one not wearing tiny shorts. And, most important, the staff is incredibly friendly and approachable, especially for beginners. I had a wonderful teacher who knew my name and made sure I was OK during my first class. I was impressed she took the time to review the student roster before she entered the studio. 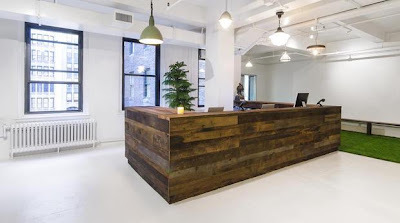 Other great things about Bikram Yoga Herald Square? 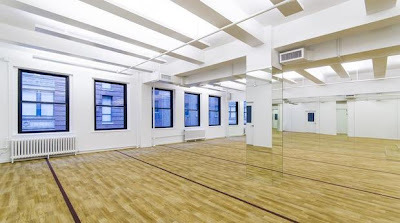 It's the only all-inclusive Bikram studio in NYC. This means class price includes towels, filtered water (bring your own bottle), and mats. Also, and I know this is important for us girls, the locker rooms are as spotless as the rest of the studio. 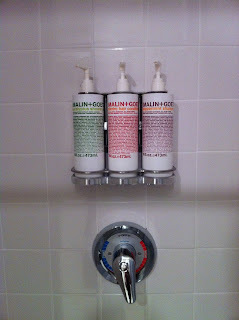 Yes, those are Malin + Goetz products in the shower, so you can leave your shampoo and conditioner at home. Here's the 34th Street deal: mention the 34th Street Partnership and your first class is just $10. Also, you get 10% off any introductory package (weekly or monthly) that you buy that day, for use on your next visit. Final words on the heat and the sweating: if I can do it, so can you. I hate the heat and I'm awful at hydrating. But not anymore, because after a class one evening my husband said "Your skin looks great." Boom, now I'm now hooked on Bikram. Hydrating is everything; be sure to read BYHS's guideline on hydrating, etc. for first-timers.